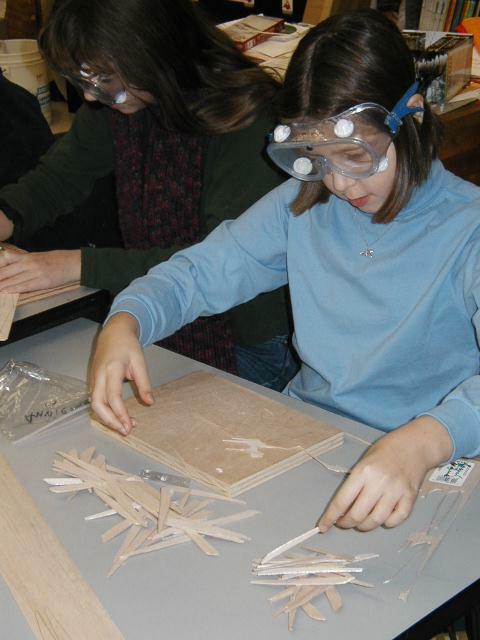 This activity was submitted by Richard Glueck, sixth grade teacher at Orono Middle School, Orono, Maine. 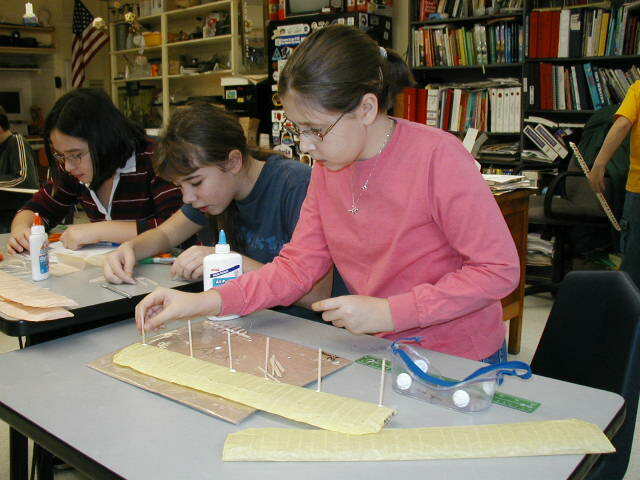 Over a period of 12 years, the Orono Middle School has involved the sixth grade in an aerospace program that was designed by teachers Richard Glueck and Christopher Chilelli to go beyond the state educational standards.� Since 1991, sixth graders have annually combined their math and science skills to reproduce faithful, full-size replicas of the shuttle flight deck, the Mercury and Gemini spacecraft, two Apollo EVA suits, the M2-F2 lifting body, flying copies of several Wright and Chanute gliders, the Ritchel 1896 bicycle powered airship, and a hot air balloon.� Before any of the full-scale replicas could be undertaken, understanding construction and engineering by modeling.� What follows is a description of that modeling process, as adapted to building a replica of the Wright 1902 glider, in celebration of the Centennial of Flight. 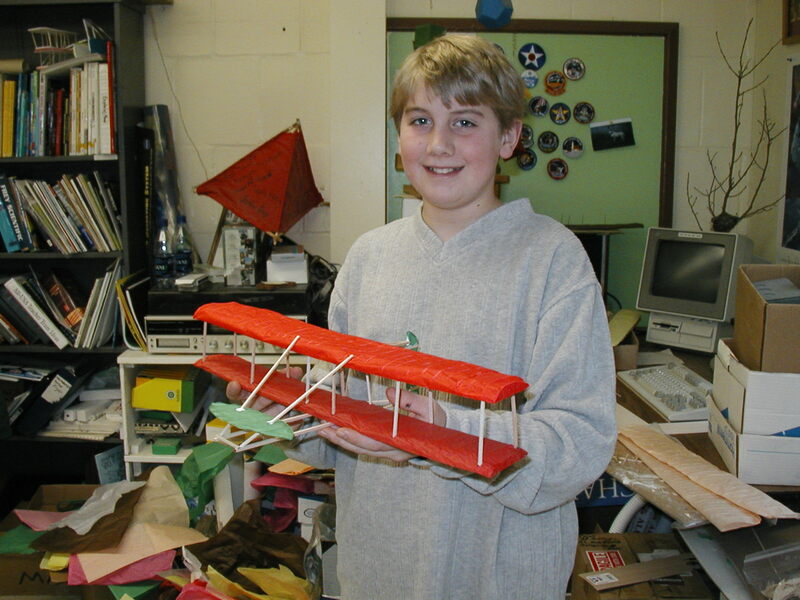 To set up the program, a blackline drawing of the air or spacecraft being modeled had to be obtained.� The teacher undertook this job, searching museums, libraries and the web for appropriate guidelines.� One resource that has proven very useful has been World War I Aero Magazine.� For the 1902 glider, I chose to utilize plans made available on the web at:��� http://www.first-to-fly.com/Adventure/Workshop/1902plans.htm These plans are very complete and I edited them a bit to make them 6th grade friendly. 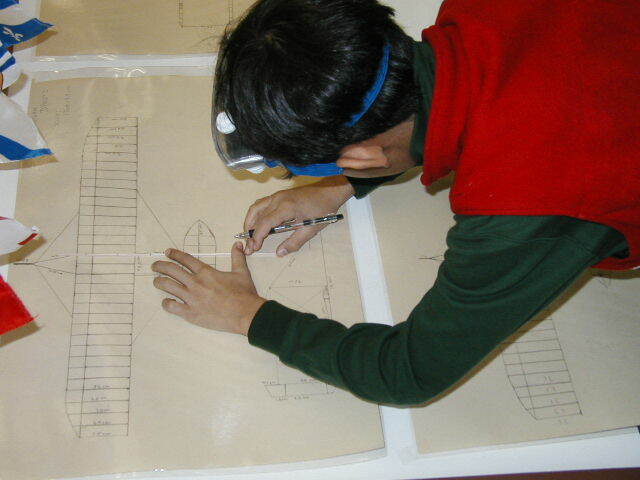 The first step in the educational plan was to copy three views of the aircraft; one in profile, one from the top down, and one face-on.� We eliminated the measurements on the plans using correction fluid and challenged the students to use historical photographs of the Wright 1902 glider in flight to estimate a scale.� Certain clues, such as the average height of people in the pictures allowed students to come up with sensible measurements.� We discussed these in class and then applied the real measurements to the plans.� In fact, this is not far from the efforts facing aviation historians when recreating the Wright gliders.� Measurements are historical uncertain, and the Brothers used their gliders as fuel for the woodstove at the conclusion of their experiments! 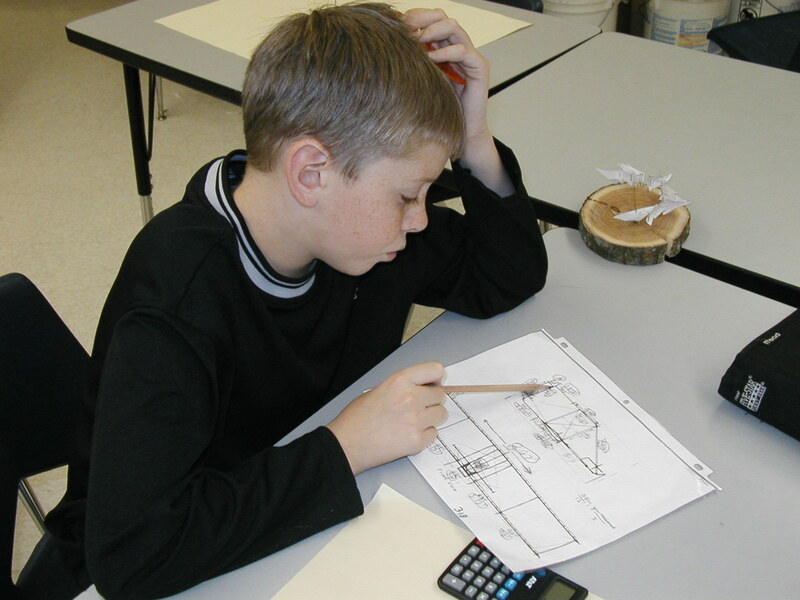 The next goal of our 6th grade aerospace engineers was to utilize rulers, protractors, and calculators to draw a larger representation of the glider in three views.� From these student drawing a model could be built with greater understanding and guidance.� Each student drew independently, but all students could confer and discuss methods of drawing and sharing constructive criticism.� This worked extremely well.� All drawings were then graded with a rubric that considered proportion neatness, accuracy, and labeling.� The premier student drawings were laminated and posted in the front of the room for reference and to model quality work. 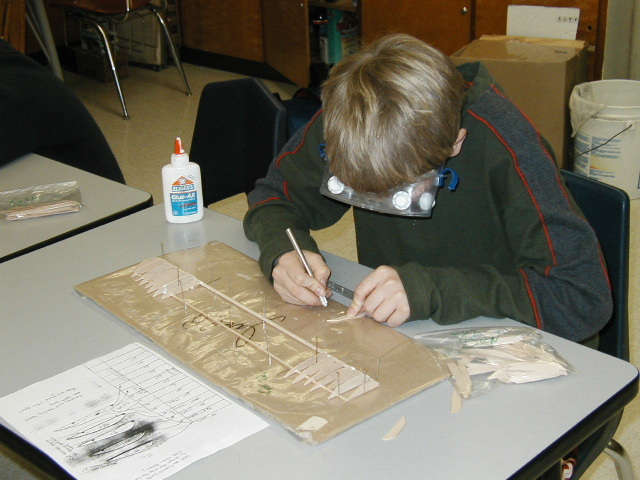 Balsa wood was ordered from Midwest Products in sheets that measured 3� x 36� x 1/16�.� This would be used to for ribs along the wing skeleton.� Spar material was ordered in two dimensions; 3/32� x 3/32� x 36�, and 1/8� x 1/8� x 36�.� The thicker spar material would form the leading spar while the thinner material would form the trailing spar. 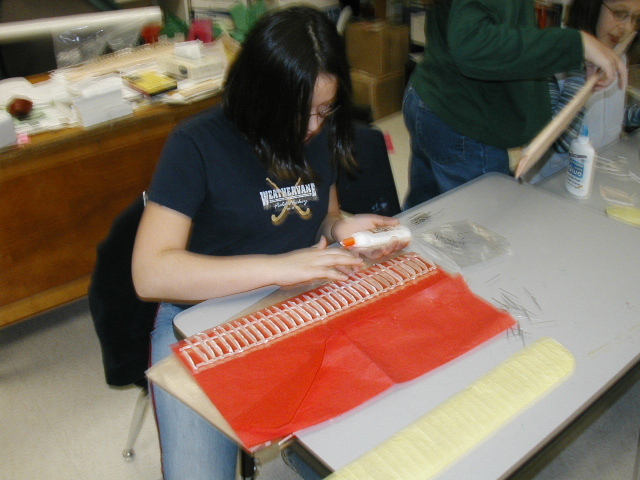 As teachers we used the drawings made by the students to sketch out five wing rib templates, each appropriately notched to accommodate the transverse wing spars.� These template shapes were transferred to the balsa wood for cutting out with X-Acto knives.�� Certain templates were glued to thicker cardboard to aid in the scribing.� At one time the High School shop made �cookie cutter� shape in an attempt to �punch out� ribs, premeasured and quickly.� This did not work well, and the best results came from individual being responsible for the quality of their own products. 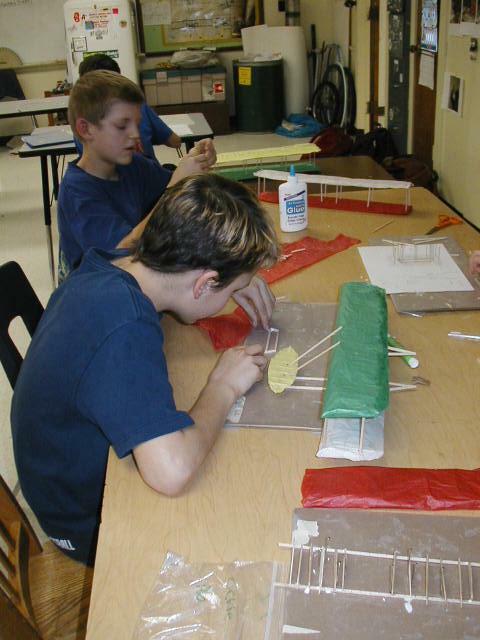 After wing skeletons were assembled and dried, colored tissue paper was laid out to wrap each wing.� We tried to use tissue that had a smooth and less porous surface as it resisted tearing a little better.� Wings were wrapped by smearing white glue along the undersides of the spars and along the tops of the ribs.� When wrapping the wings, we planned to lay the rear underside of each wing along the tissue paper edge.� We folded the tissue up and over the front of the ribs and then back toward the trailing edge, keeping it as tight and smooth as possible.� This takes a little practice.� When the glue dried, the paper shrunk a little creating a very effective curvature or dihedral in the wings.� We tucked in loose edges and trimmed what couldn�t be glued down.�� The trailing edge of the wing was formed and firmed into place by putting white glue on the student�s thumb and forefinger and pulling the paper to a fine edge. 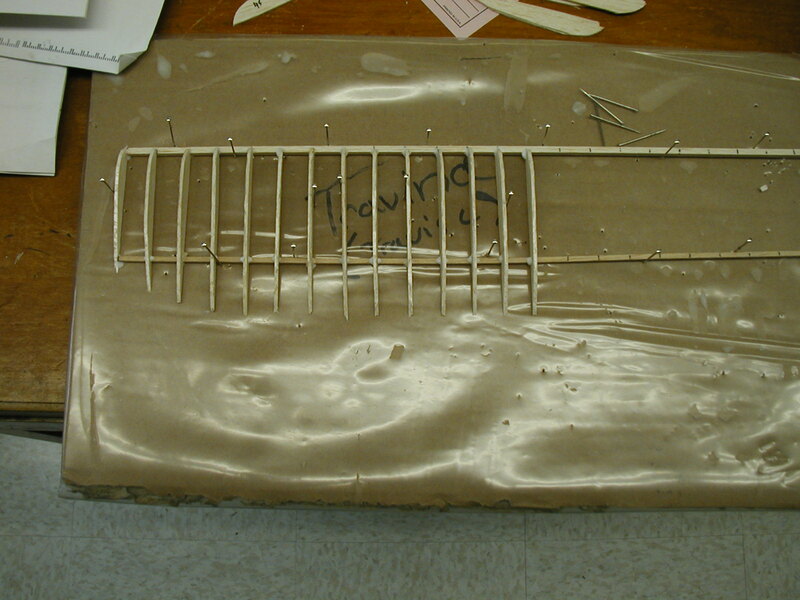 When both wings were wrapped and trimmed, struts were cut from the left over 3/32-spar material.� Using their plans as guides, they strut openings were marked and cut in the lower wing first.� The big concern in gluing struts was to make sure they were glued exactly perpendicular to the base of the wing and didn�t lean forward, backward, or to either side.� When the struts were dried over night, the bottom wing was inverted and the strut holes marked and cut in the top wing.� Glue was put on the struts and they were inserted into the underside of the top wing, and allowed to dry. 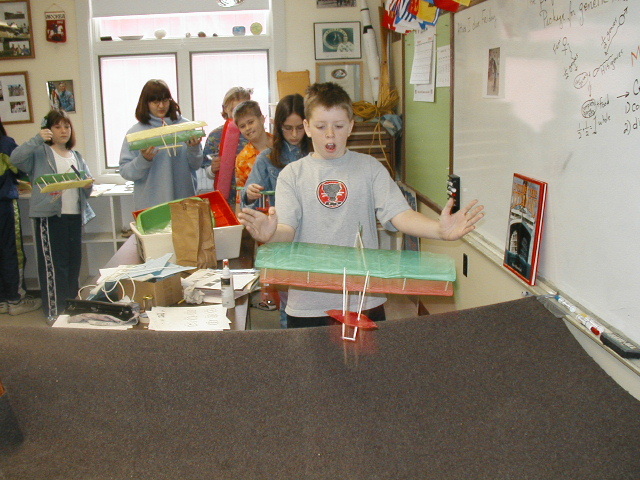 Gliders were allowed to dry and hung festively from the classroom ceiling until the day of flight test approached.� On flight test day, each student glued a penny the underside of the lower wing to increase the mass of the aircraft.� A blanket was stretched out as a safety net to catch gliders that didn�t create enough lift on launch.� Each student held their own glider by the wingtips and gently pushed it forward into the air over the blanket.� Gliders with enough forward thrust and sufficient wing camber gently glided in a descending slope to the blanket.� Some stalled.� Some never quite reach aerodynamic configuration in the building process.� It didn�t matter, since every student took an idea off paper, redrew it, and produced a replica of their own.� What seemed impossible at the beginning of the project had taken wing.